Despite a relatively large original mintage, the 1822 Capped Bust Half Eagle has emerged as one of the most famous rarities created by the United States Mint. Virtually the entire original production of 17,796 pieces was melted, leaving only three known survivors. Two of the known examples are permanently impounded in the Smithsonian’s National Numismatic Collection, leaving only a single example available to the public market. The massive gold melts of the early 1820’s were the result of the higher market price of gold compared to the face values of United States gold coinage. Around this time, the metallic content of the half eagle or $5 denomination had risen to about $6, prompting even recently issued coins to be promptly melted. 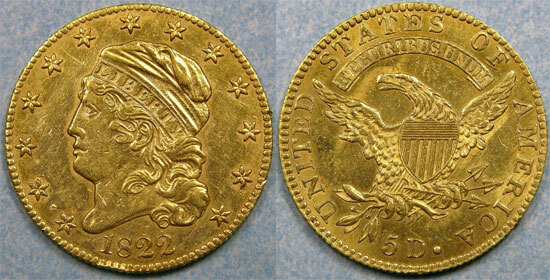 This situation had an impact of many gold issues of the era, with the most extreme situation occurring with the 1822 half eagle. In 1941, J.P. Morgan famously offered the shocking sum of $35,000 to purchase an example of this rarity, which was declined. The most recent public offering was for an example from the Louis E. Eliasberg Collection which reached a final bid of $687,500 an an auction held in 1982.